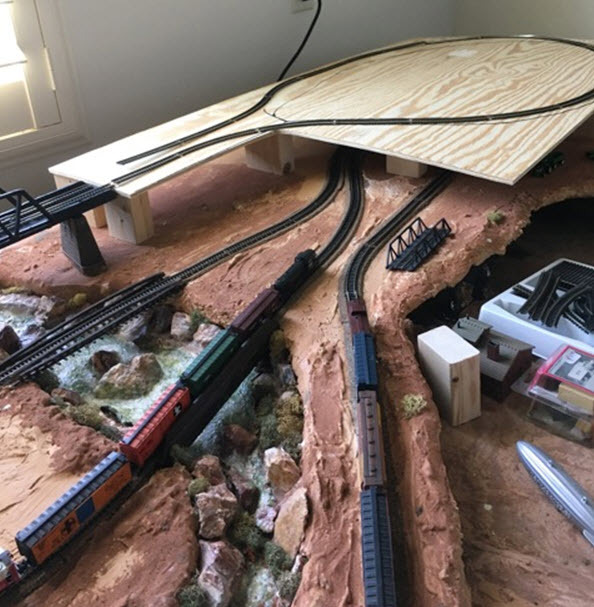 Thanks to Werner Balsterholt, the N scale layout previously owned by Tom Scardina, Jr. is rapidly nearing completion. 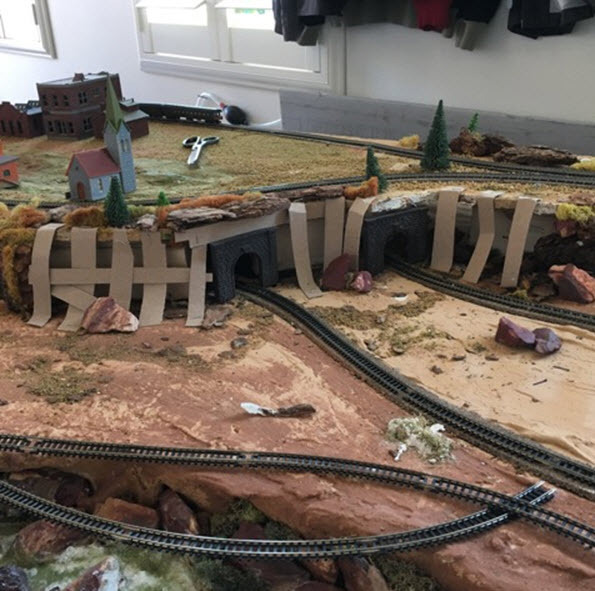 Werner's photos and descriptions below show the recent progress along with his scenery modeling skills tailored to this smaller scale. 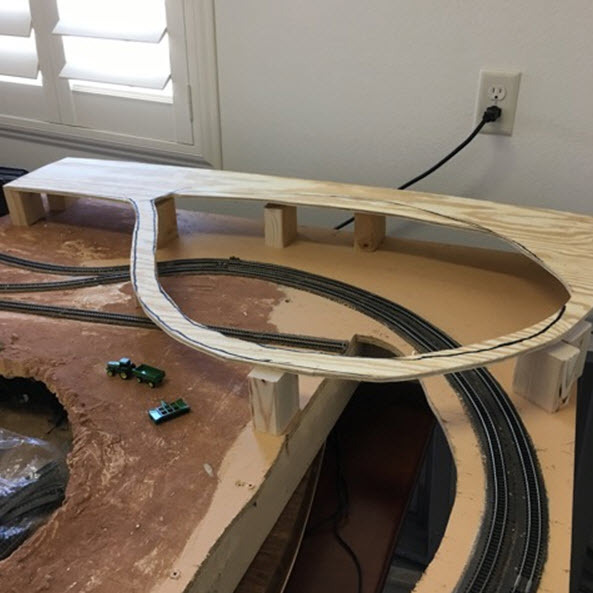 Expanding the upper level of the layout started with a 1/4” sheet of plywood, elevated 3 inches over 2"x4" blocks; anticipated track is put on place to fit. 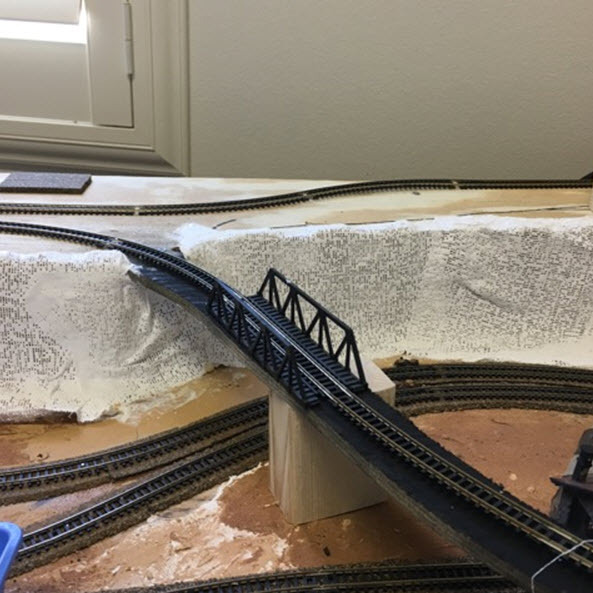 The new original portion of the layout is taking shape, with an anticipated trestle in the foreground. 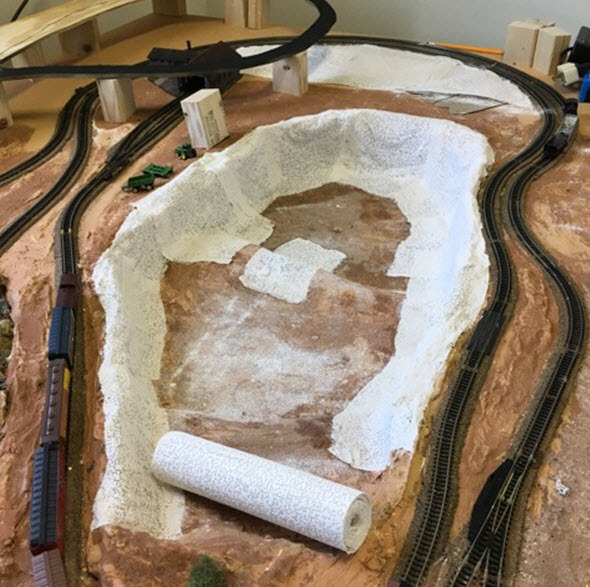 The original layout had a huge gravel pit, but sidewalls were open. 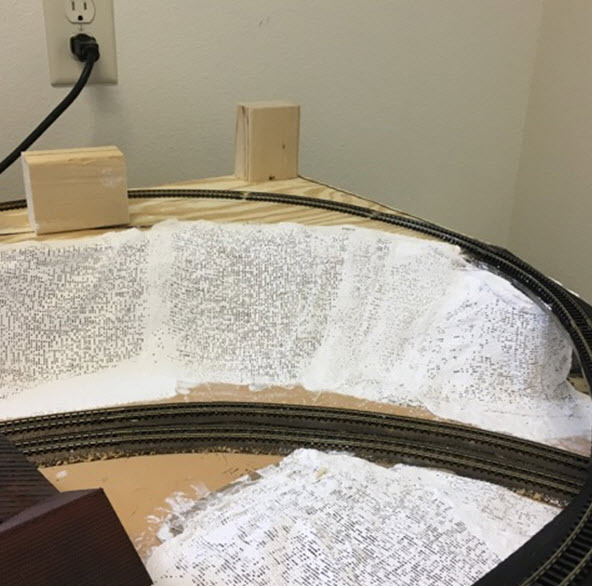 Using Woodland Scenics plaster cloth, the sidewalls are now completely hidden. Also, there was a large opening in the original layout. I used 2” wide cardboard strips tacked to the original board to provide support, and then overlayed plaster cloth to cover the opening. 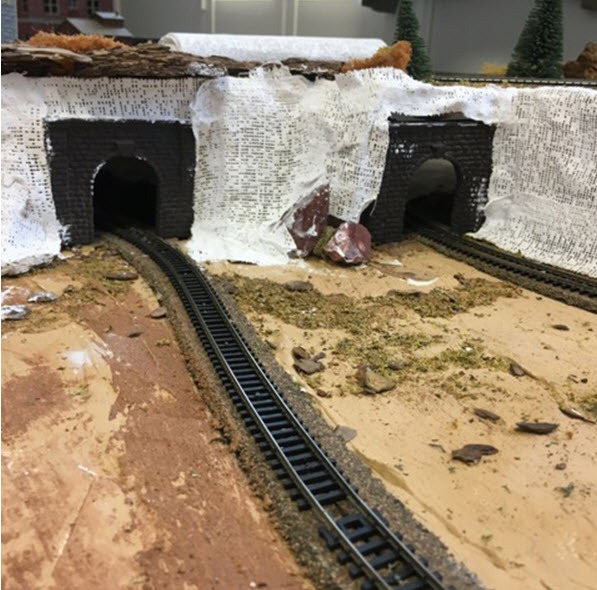 The original layout’s scenery was starting to fall apart, so I decided to re-do the sections where the tunnels existed. Using cardboard strips tacked to portions of the previous scenery to provide support for the next phase — layering plaster cloth over the exposed surfaces. The results of the plaster cloth covering the exposed surfaces is shown. Once this sets, the plaster cloth will provide strength to support additional scenery changes. 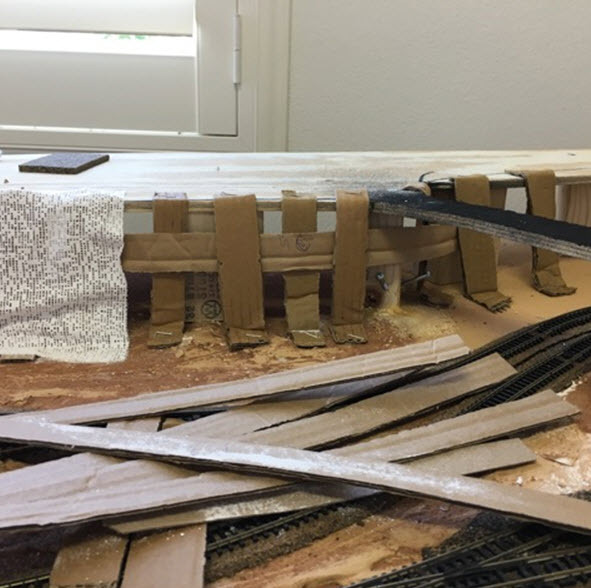 This photo provides a look at the building of the scenery covering the new elevated section of the layout. Cardboard strips in the foreground are cut to provide vertical support, and are interwoven to provide horizontal support and strength. All strips are stapled to the main boards, then covered with plaster cloth. The finished work (plaster cloth over cardboard strips) now provides a base for additional scenery work. The supporting structure for additional scenery work for the new level is done.